Admittedly, the East is usually the Conference I have the greater grasp on, given my seeing all the teams play my team, some as many as six times a year. Should give me an advantage, no? Well last season it did, as I correctly picked 7 of 8 playoff teams. But this year, I'm afraid, I've no more insight than anyone else. Despite a few nay-sayers, Boston has done nothing in the off-season that indicates to me that they'll be any less dominating this season than they were the last. What they lose in Kessel, I do not see how they don't gain at least 60% of that with a healthy Marco Sturm. And assuming even half as good a season from everyone else - Krejci, Wheeler, Savard, Lucic, Chara, Thomas - I don't see why they won't be tops in their division and in the entire conference. They're my pick, mock if you will. Key Questions: How do they rebound from last year's success - individuallly and as a team? Do they even miss Kessel? Hard to say TO will not be better, with a few nice additons to the team, in Kessel (when he gets back healthy), Komisarek, and Beauchemin. Oh yeah and Colton Orr. ;) But I immediately asked the question all you asked - just how will they possibly score? Grabovski and Ponikarovsky can only do so much until Kessel arrives, and even he is not the master solution. But I'd like to think the defense, with what I hope to be a great followup sophomore season for young-un Luke Schenn, and Vesa Toskala, if he can remember what it was like back in San Jose, will steal a few games. I'm just not sure they'll crack what's going to be a very tight playoff race in the East. Key Questions: Will Komisarek grow to be loved in Toronto? How much playing time will "The Monster" see and how will he perform? I don't know what to expect from Buffalo, because they...well, they never do anything much to change my mind. Miller, when healthy, is a fine goalie. And scorers like Vanek, Pominville, and Roy have been known to put up fine numbers. But is it enough? Unless they put all the pieces together and are able to re-gain a glimpse of that former glory of a few years ago, I just don't think so. I have them missing; perhaps making it close, but missing. Key Questions: How will Ryan Miller, presumably, being on Team USA, affect a Sabres late season push? Despite nice additions of Kovalev, and Michalek and Cheechoo, I can't see why the ship that has gone so horribly adrift will automatically right itself so soon. If I had to guess, there was more going on in that locker room than Ray Emery. And more going on than Dany Heatley. But that's just a guess. My biggest problem with Ottawa is in goal. I mean no disrespect to Pascal Leclaire, who in Columbus actually put up some nice numbers when healthy, but he need to be healthy and more to make this team a contendor. They still boast the Phillips/Volchenkov pairing, but that tandem might not be as great as it once was, and even if they are, two defensemen can only play so much. Overall, I would like to think this team will score, but if they haven't truly addressed their "problems" I don't know what we can say about them. Key Questions: Is Leclaire up to the task? Do Spezza and Alfredsson mourn or thrive without their long time linemate? Does Kovalev finally find the one thing that alludes him - consistency? Montreal - EVEN to ???? Montreal, like the Rangers, went a huge overhaul in the off-season. Perhaps even bigger. New ownership, new coach, and new entire "top" line. It'll be interesting. The one steady difference I see though, is in nets. The Rangers seem pretty certain; Montreal, however, does not. Until someone can prove to me that Carey Price is the real deal, I will still think them stupid for wasting a perfectly better and perfectly willing goalie in Jaroslav Halak. But they've made their decisions and they are the ones that have to live with them. On offense, Cammalleri is my favorite pick-up for them. But surely you wonder where it'll go from there. Their second line tails off big time after that, with no #2 center. And if we're calling Gomez the #1 center, well, I think I've made my opinion on him pretty clear. Look, they'll either fall flat on their faces or surprise us all. Again, like in Ottawa, I question whether in their "house cleaning" they got all the bad parts out. Key Questions: Can the still young Carey Price live up to the hype? Is this team so small they'll get knocked out of the rink on any given night? I see no reason why last year's embarassing Game 7 loss to Pittsburgh will not motivate the young team. The previous year, a game 7 loss in the 1st round made them hungrier. They responded. I don't see why the same won't play out. Ovechkin, one of the, if not the, best in the league, needs to be their best player, and make everyone else around him rally to the cause. If anyone can, he can, in my opinion. Their question, too, will be in nets, but Varlamov proved, to more than a few people, that he's a very good goalie. If they have to go to him, and they might, he'll be up for it. Overall, on a team that mostly stood pat - lost Federov to Russia and gained a nice pick-up in Mike Knuble - I believe they'll be where they were last year, on top of the division and at the top of the conference. Key Questions: Will Ovechkin's disappointment over last year serve as a motivator? Does Varlamov steal the #1 job from Theodore? Well, again, I feel for the Thrashers. I would have loved to see Kovalchuk get to play with both Zherdev and Antropov - that would have been a sight. Instead he gets only one Nik, the latter, in hopes that together they'll provide some Solviet magic. I'm more curious to see if the young guys are able to step up and step in - Bogosian in a second season and Evander Kane in a potential first. There isn't much to play for in Atlanta, sadly, so it'll be a case of small victories, one at a time. Key Questions: Does Evander Kane make the team and make an impact? Does Kari Lehtonen regain some of his former promise? Hard to think Tampa will not be a better team than last year. They may have finally gotten some defense to go along with all their offensive weapons. Add #2 draft pick Hedman, and Vancouver's journeyman Ohlund, and they've got a better team. A sophomore year for Stamkos where I expect him to further grow. And always two of the potential top players in the league - St. Louis and Lecavalier. Tanguay, who had a good year for Montreal, and Niittymaki, who was good at times for Philly, should be good pickups. I'm not sure it's enough for the playoffs, but they should be much improved. Key Questions: Does Stamkos have a sophomore slump? Can Smith get the job done in nets? Everyone seems to think Florida will sink to the depths without Jay Bouwmeester. I may be going against the grain, but I don't think that'll happen. I'm not saying they are going to be a playoff team (although I almost want to and will root for them to have a good year), but they won't be the worst team either. They made strides these last two years, and it was a horrible disappointment to just narrowly miss out last year. Their biggest strength is in nets, with Vokoun and Clemmensen, coming off a great year in NJ in covering for the ailing Marty Brodeur. I don't think that'll be their problem. The rest of the team, I am not so sure about. But again, I'll root for them, even if I think this may not be the year they just sneak in. Key Questions: Just how much will losing J-Bo really affect this team? The Hurricanes shocked me, with their end of the season and post-season push last year. Took me by surprise, and perhaps a few others as well. This team seems to find magic by taking pieces of their 2006 Stanley Cup winning team and bringing them back home - like Cole last year, and perhaps Aaron Ward this year. They added Kostopolous from Montreal, which I think could be a nice little pickup. I think Paul Maurice, et al, deserve a lot of credit here, even if only for creating an environment that is seemingly the only environment than Sergei Samsonov can play in. ;) I'm kidding. I'm a big Paul Maurice fan and wish him well. I think if Staal plays like he can, and Cam Ward's back does not act up, this team can be a playoff team again. They have all the pieces, old and new. Key Questions: Does Cam Ward enter contention for Team Canada, and does it affect this team? Not as bad as some may thing, and gosh will it be fun to finally see Tavares (although not so fun if he makes the Rangers his personal punching bag) up close and personal. As predicted, the Islanders won the sweepstakes and they now have the #1 pick to have the fans come in bunches, even if small bunches. Either way, it's a good thing, but it may be the only thing for the time being. The team is young and guys like Bailey and Okposo need time to grow. Defense will be led by Mark Streit and, thanks to Tavares, he may not have to be the leading scorer on the team this year. Goal, inevitably, is where it is going to be interesting. Both Roloson and Biron can be good to great, and will need to be if the Islanders want to get out of the basement. Both surprising, but good pickups, in my opinion. Wait, what, you say, the Islanders have another goalie. Hmm. Oh, yeah, right. I'll believe it when I see him play. (No disrespect Ricky; I wish you a speedy recovery to health). Key Questions: See above. How long before Rick D.P plays a game - or does he? As much as it pains me to say, the Pens will be fine. They've got two of the best players in the league, a goalie that finally proved himself when it counted, a pretty steady core coming back. They'll be a top team in the division and in the conference, barring any major injury. This, does not however, guarantee some sort of repeat. They may have the heart but not the energy after going the distance (and coming away on both sides of the equation) for the last two springs. But in the meantime, with Scuderi (although important he was) their biggest loss (well, although technically wouldn't Hal Gil be the biggest, by default), I don't see them being in too much trouble. Key Questions: It's pre-season and Sid the Kid is injured - will he stay healthy this year? Can Malkin build on last year's super campaign? I like Philly. No, not in the I want them to win it all type of way, although goodness knows I'd like that better than watching Pittsburgh hoist it again. (I still have nightmares when that commercial comes on to buy your merchandise - seriously, still??) I thought last year they'd be in the Eastern Conference Final. And they probably would have been, if only they could have gotten out of their own way against Pittsburgh (and oh how different it all would have been!?) They have the offensive tools, a group of 20+ goal scorers that makes any team in the league jealous, even with losses of Lupul and Knuble. If rumors are proving right, James van Riemsdyk could be a super gain for the team, if he plays. They got nastier with Chris Pronger and Ian Laperriere. The big question (again) is in goal. Isn't it always the question for Philadelphia? If Ray Emery can keep his head in the game and play like he did in the playoffs the a few years back, Philly will be fine. It's a big if, though. Me, I'm thinking Philadelphia has the best chance to win the divison. Key Questions: The only question - the one in net. Oh and will Chris Pronger be able to use his elbow on this side of the Mississippi river? I can't go as far as to say they'll be better, with losing Gionta, and Madden, and a bunch of backup goaltenders (Weekes and Clemmensen), but I won't say they'll be worse. Because if they struggle, Lemaire and Lou will pull some magic out of the puck bag and we'll be treated to the days of the trap - again. I smell some 1-0 and 2-1 games. Ooh, now where is Tom Renney when you need him? (joking, joking... eh, not really so funny). If let go, this team will depend on Zach Parise and Travis Zajac to score, and would benefit if Elias had a good year this time around. Their defense never looks impressive, but, with a system and soldiers to follow it, is hasn't mattered yet. Every year I want or expect it to finally be the year they are out, but I'm just not sure I can say this'll be the year. Key Questions: Does Jacques squash the scoring out of Parise, now officially a powerhouse in this league? If Brodeur is #1 for Canada, can the Devils depend on Yann Danis to do for them what Clemmensen did last year? Rangers - EVEN to ????? I saved the best for...well, never mind. The biggest question, second year and running, is with my favorite team - and this year I'm even more stumped than last. The Rangers are a better team with the coach they now have - with his go-go-go attitude and his hatred for anything less than 100% effort. This team may finally come to know what accountability means. However, we may all come to soon find, there isn't enough talent, just yet, to get the job done. Contracts to Redden, Rozsival and Captain Mumbles (Drury) will continue to haunt the team because they simply are not worth their places on the team and keep other more worthy people from being on it. The defense is very young, beyond the two just mentioned, although they have the potential to be very good. Gilroy and Del Zotto make me smile. They and Staal are the future of this team. But they may not be there just yet. The Rangers offense improved by gaining Gaborik, but Gaborik brings the biggest question mark of them all. Guys like Anisimov, Lisin, Prospal and Kotalik, should all impress, and improve the goal totals, namely, one would hope, on the powerplay. But is it enough? The biggest assests to this team - Gaborik and Lundqvist, can be their biggest detriments. Both depended upon to lead their countries in Vancouver in 2010, an injury to one or both will end the Rangers season in February. They are better, but, not that better just yet. Key Questions: Can Gaborik stay healthy enough to be top 10 caliber in this league? Is the supporting cast enough? La, la, la. Okay, I've put it off enough. And in some ways, I hope I am wrong about the below. Just want to clarify that. Sad reality, I wasn't sure I was going to put the Rangers in and went back and forth a bit. I'm very sure of the Top 5, and not whatsoever sure of the bottom 3. Again, assume NJ is in until you are proven otherwise. And I think the Rangers are, indeed, better than they are being given credit for. But teams like the Rangers are really crapshoots. They can thrive or stumble. I'm gambling on experience of the last few years getting them just there, and just in. After all, the East has kinda proven in the last few years that it doesn't "vary" that much, and there has to be someone really good to knock a perennial team out. As much as I'm not sure NJ and NY are great teams, I'm even less sure another team is good enough to knock them out. Narrow misses, if I had to guess - Tampa, Toronto, perhaps Montreal (who I did wrestle with having in there), and maybe Buffalo, with Atlanta and the Islanders near the bottom of the Conference. Stay tuned - hopefully - for a mini Rangers and Coyotes preview before they take the ice this weekend! *I am not an expert and don't claim to be. Like last year, I have not read any predictions on TSN.ca, ESPN.com, in the Hockey News, or at various blogs. Why? I'd rather put my own random thoughts on here, right or wrong. *Chance are, they will be wrong. It's too hard to predict anything in this league, and that's especially true in an Olympic season. So much can change for teams who may lose their best player or players for a long stretch at a critical time. Plus, as we've seen for two years running now, playoff races have come down to the wire, some to even the literal last games of the season. With that established, I'll try to be shorter than last year with this (yeah right! ), but yet still include for some randomn thoughts that can provide enjoyment during the post regular season analysis. Like last year, I'm first looking at what teams I think will be better, worse, or even to last year, before giving my top 8! I like Vancouver's chances here, maybe even moreso than last year. Like so many other teams, their biggest star is in net, and Roberto Luongo may just be the #1 guy in line for Team Canada at the Olympics in Vancouver. Lot of pressure on a guy who faced some injuries in the recent past. But I think he's up for the task; no doubt he is committed, maybe more than ever after yet another disappointing playoff loss. On offense, it is truly the twins team now, if it wasn't before, with oft-injured Demitra, well, injured again. Key Questions: If Alex Burrows can have a good follow-up to last year's surprise season. And if the talk of the town - literally - Cody Hodgson makes the team and lives up to the hype surrounding him. I may be alone in this, but I do not see how Bouwmeester makes this team THAT much better. He improves the defense, but even though he was lauded as the best thing out there, he's never proven to me that he's anything beyond the most boring intermission interview next to "Captain Mumbles" (Chris Drury). Yet, he's still young and maybe he'll come more into his own in Calgary. Scoring will suffer, losing a great player in Cammalleri to Montreal. I'm not sure they make it up. Captain Jarome Iginla and good guy Craig Conroy remain my favorites on this team, but I'm keeping a close eye on former Rangers Sjostrom and Dawes as well. Key Questions: Can Kipper be the goalie he has shown glimpses of during this team's success? How will Olli Jokinen respond in his first full year w/the team. I have no reason whatsoever to believe that this team will truly be better than last year, but let's get this straight right away, my reasoning has nothing, absolutely NOTHING to do with new assistant coach Tom Renney. Just so we're clear. But if we are being honest, I think that Edmonton was a train wreck at times last season but were good enough at times to make it a question of whether or not they'd be able to sneak in the playoffs. The biggest difference to this team, besides the new coaching staff is the addition of former elite goalie Nikolai Khabibulin. Maybe I'm giving them too much credit for minimal changes, but I'll still be curious to see. Key Questions: What coaching style wins or gets the most credit for how the team turns out - Quinn's go-go-go or Renney's play-for-the-shootout snore fest? The Wild missed the playoffs by the slimmest of margins last year. Looking to this year they have, for the first time in what seems like a hundred years, a coach that is not Jacques Lemaire. That alone is enough to make it impossible to guess where they'll end up. The oft-injured Gaborik is gone, and the oft-injured Havlat is in to take his place. I think this team has decent defense, and very strong goaltending, but it'll still be a question of how much they'll score. Although, much like with the Rangers, by default, if players are given the green light to go, they'll be better off in my opinion. Key Questions: Again, does Havlat, who is now, next to Mikko Koivu, the face of the offense, stay healthy and make the big impression we know he wants to? I don't know why everyone assumes that Phoenix will be the dead last time in the Western Conference this year. My votes on Colorado. Save getting a better goalie - Florida's Craig Anderson, tell me how this team got better? I love Matt Duchene - the kid is a trip; but I don't think he'll provide enough help to a team in dire need of...anything. The sad departure of long time staple and Captain Joe Sakic, means new leaders will have to emerge. I just don't see it being this year. Key Questions: Can Paul Stastny, a sensation as a rookie, rebound from last season's injury and be the leading scorer on this team? San Jose provides one of the most confusing teams to analyze. They have enough talent and they always play so convincingly - until it counts that is. Vancouver's Team1040 voted them one of the biggest busts of the last decade for their consistent superb regular seasons followed by disastrous departures from the post-season, none more embarassing than last year's journey - from President's Trophy to first round upset at the hands of Anaheim. Cheechoo and Michalek are gone, Marleau has had his Captain's C stripped, and Heatley is hoping Joe Thornton can help them both resurrect their careers in Northern California. Who's to say what will happen after, but I expect them to be one of the best in the West in the regular season; not that much has changed and Nabokov is still one of the elite goalies in the league. I'm keeping my eyes on personal favorite Manny Malhotra (and Jed Ortmeyer if he sees time with the big club). And this team in general because they are such a mystery to everyone, probably even themselves. Key Questions: How does the tandem of Thornton and Heatley fare? Will this team ever figure out how to get that "never say die" attitude when it really matters? If it's not an issue of talent, is it an issue of heart? I'm not a huge Ducks fan, and I don't know why. (Maybe perhaps Chris Pronger's departure will improve this just slightly?) I have always liked Giguere and Hiller really impressed me last year. Their defense should still be solid enough, but it's their offense that makes me shake my head in disbelief. Ryan, finally coming into his own with all the promise, with Getzlaf, who became a superstar out of nowhere it seems, and Perry. Add Lupul and Saku Koivu - tell me his reuniting with Selanne is not a good story, by the way. I'm rooting for the long time Habs Captain in his new colors even if they are not as pretty! This team is stacked. I see no reason why they won't be at the top of the conference. Key Questions: How will Koivu adapt to the West; he's been quoted as saying it is a different world even in the pre-season. Is Hiller now the true #1? I greatly look forward every year to watching this team improve. Drew Doughty as a rookie last year, looked like he'd been running the powerplay for years. Scuderi will provide some much needed experience to this teams backline, coming over from a winning team. A lot of people are saying perhaps this is the Kings year to finally make a push to the postseason. I am crossing my fingers for them, but even if they fall short, I think they will definitely continue to improve and make it a real challenge. Key Questions: Kopitar's production has slowed but he's going to need to be a top scorer for this team - can he do it? Is Quick ready for the big time? My adoptive desert team. A team I want to see succeed more than almost any other. A team that my heart wants to tell me will excel because they have heart and talent and a young team full of kids who want to prove something to everyone. And because they have one of the BEST captains in the league, with more talent than he is credited for and one of the best attitudes I've ever seen. Yeah. I want them to do well. But I can't think with my heart; I have to try to be diplomatic here. What's good: this team was a playoff team until All-Star break last season and showed strong games against the powerhouse Sharks and Ducks. The bad: they couldn't hold onto the lead they had gained and finished the season scoring the 4th fewest goals in the league. I think Aucoin should help Jovo, Yandle, and Michalek provide some points from the defense. I think having guys like Upshall, Lombardi, and Prucha (sigh) for a full year will help to boost those goal totals. But I am just not sure that they are able to overcome all the emotional and on-ice difficulties. They are a young team and no one (seriously folks) should have had to endure what these players did last year, all summer, and still today. I'll be watching and rooting though, and hoping this team beats the odds. Key Questions: Does Bryzgalov regain his former solid play and be a necessary force for this team? Wlll Vrbata, who had a very impressive season with the team two years ago, come back after a dismal and disjointed last season in Tampa? For my love and respect of Mike Modano, I hope this team is able to forget about everything that went wrong last year. From Turco forgetting how to play goal, to long-term injures to Morrow, Richards and Zubov, it was just all not good in Dallas from the start. (And no, the guy with the initials S.A. was not the one to blame). They have a new GM in Niewendyk nand a new coach in Marc Crawford, coming off a gig on HNIC. I'll be interested to see how the "coach only dogs can hear" will fair in the Lone Star State. Let's face facts though - this team can be very successful if a few things fall into place. If Turco plays like he did 2 seasons ago and if they stay healthy. They have the veteran tandem of Morrow and Modano, and plenty of talent to score with Ribeiro, Richards, and Eriksson. 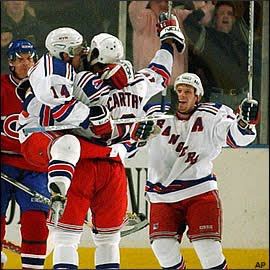 Their defense will be suspect, as for the first time in more than a decade Sergei Zubov will not be on their blueline. Even though he was oft-injured in most recent seasons, he is the type of player you take for granted and miss when he is gone(Trust me on this!). Key Questions: I've already kinda asked it - who steps up on defense for this team? Will the real Marty Turco please show up? Despite some changes in player personnel, I never root against Detroit. For when I do, I find, I often look foolish. They never fail to have someone waiting in the wings (no pun intended) to step into one of the best systems in the league and be game ready. They came within a game of winning the Stanley Cup, again, and that was on an off year for the team and their best guy and leader Nick Lidstrom. There's nothing much I can say about them, except that until it is proven otherwise, Detroit is legit. Key Questions: Will rookie Ville Leino live up to the hype I keep hearing? Wlll the loss of Marian Hossa be as good a thing for Detroit as it was for Pittsburgh? I have always liked Nashville, and they always seem to hover around the same place - right around the 8th seed in the playoffs. Sometimes they get in, and have memorable playoff run-ins with San Jose, and sometimes they fall just short. Last year was one of the just short years. Their defense shone behind Shea Weber last year and Pekka Rinne impressed in nets. It's their offense that concerns me. JP Dumont, once always counted upon to come through, has watched his goal totals slip in recent seasons. I'll be curious to see how they do, but if I had to guess, this is not a year they make the playoffs or come as close as they had been. Key Questions: Is defense enough or will this be a LONG season in Tennessee? My other once favorite adoptive team. Columbus pleased many, myself included, by finally making the playoffs for the first time in their existence last season. They then promptly, very promptly, exited in four games to division rival Detroit. Steve Mason made such strides to get this team where they were, but for Columbus to have moved on in the playoffs would have meant a stand-on-his-head situation from the young goalie. And it just didn't happen. But experience is a teacher and I think it was good they got the first steps of that to build on for this year. If Nash can regain his brilliant top form and bring his teammates along for the ride, there is no telling how high they'll go. Vermette was a nice addition last year. Huselius and Umberger had moments, but they'll need to do more. As a fan, I want to see how Filatov performs this year. Former Ranger Fedor Tyutin continues to impress, as many of us thought he would and I expect him to continue making strides every year. In a questionable move, team and fan favorite Manny Malhotra is gone in favor of Pahlsson, who will be paid more than Malhotra asked for. Bottom line: I think Columbus will go as far as Mason and Nash will take them. Key Questions: Just how far can Mason and Nash take them? Will Freddy Modin ever remain healthy enough to make a difference here like he did in Tampa once upon a time? Chicago - EVEN to BETTER to ???? Well, once upon a time earlier this summer, I thought this team was going to be a Cup favorite. And they still may be. But an off-season of turmoil and whatever the heck you want to call it puts a lot more into question. The Kane saga disappeared (thankfully), but the rest of it remains. Marian Hossa was given a 12-year contract but will not start the season due to injury. The GM who built this team was let go, abruptly, to former Hawk Marty Havlat's extreme annoyance. They still have an overpaid Brian Campbell which is only the beginning of the salary cap concerns. And their win now or never goal is backstopped by a French goalie who cannot decide whether his last name is Hue-ay or Hue-T. Look, I love the Hawks and I love the story they wrote. I still believe they'll be very good. But I'm still curious how it all comes together. If it is win now at all costs, do they have all the pieces in place? Key Questions: The goalie known as Huet - is he the real deal? Can Kane put the off-season drama behind him and have as stellar a year as he did last season? In what shape will Hossa find this team when he joins them just early of the new year? Will he make the difference they think he will? I, with embarassment, must admit that I hardly ever watch the Blues. Common sense shows it's harder for me to watch games that start during the 8 o'clock hour because I'm already probably invested in some game going on in the East. My knowledge of St. Louis suffers for that. But, I do always silently wish well to John Davidson's team. And now Darren Pang has left the desert for Missouri as well, so chances are I'll be happy to turn on a game or two (Phoenix's loss is St. Louis' gain and I owe Panger a lot for being so willing to lay praise on Prucha when he joined the team at deadline). Back to the ice, it was only a matter of time before St. Louis got good. They had the young talent, we kept hearing about, but I don't think anyone would have predicted how good it would come together for them last year. A team of players where I only know most of them by where they came from before they got there, they were able to make huge strides despite injures to key players (Johnson and the golf cart, Legace and the carpet) and leapfrog over a few teams to take the 6th seed last spring. I still know hardly anything about them, but I know better than to root against a team that has Ty Conklin as their back up. (As I said before, his last two NHL teams lost in the Stanley Cup Final. But they made it to the Final!) Key Questions: Can Mason deliver for this team? How do Kariya and Johnson rebound from their injuries? Okay, so that wasn't any shorter than last year. But, did you really believe me when I said I'd try? =) Without further ado, how it'll all shake out. Narrow misses to Columbus, Dallas, and Los Angeles, even though truth be told it's a big risk to have all three Western Canadian teams in the playoffs and to ignore how potentially good Dallas and Columbus can be if all goes right. But it's a risk I'm going to take. In fact, my only thought, as previously mentioned, is that I feel strongly that Colorado will end up last in the conference for a second year in a row. But anything can happen, right? Stay tuned for the Eastern Conference Predictions soon - which may just prove to be harder than I originally thought. Ever since the news of Theo's reinstatement to the NHL and subsequent invite to Flames training camp, I've been meaning to write a few words on the former Ranger. I was too young to see Theo Fleury in his prime, winning the Cup in Calgary and pouncing by surprise on the league, a little man with an energy unmatched by many. 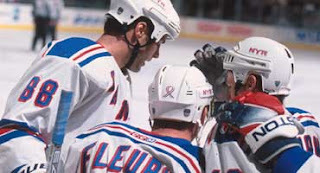 But I wasn't too young to see Theo Fleury in New York, the roller coaster of ups and downs. The ups very, very high, and the lows, very, very low. If we're being completely honest here - I was a big Fleury fan. Probably, in part, because I may have not seen the whole picture. All that really mattered to me was that this guy - apart from any demons he may be fighting - was really good for our team for a period of time. Really good. The numbers will tell you that in 2000-2001, Theo had 74 points in 63 games, and ranked 37 in the league. The following year, he'd score 63 points in 82 games, and come in ranking at 42. But what the numbers won't tell you is how Theo was part of something special in New York, something that I, as a fan, wanted to root for. The fabled FLY Line - (yes, fabled! For what line besides Jagr, Nylander, and Straka, and they had no name for them, came even as close to grabbing our attention, I ask you? ) - had a crazy stretch of time where they were all ranked within the top 5 in the NHL in scoring. Yes, all three. Sure, the fable faded. Theo had a few "incidents." Lindros has another "injury." And York ended up in Edmonton. But I choose to remember what was. And remember it fondly. 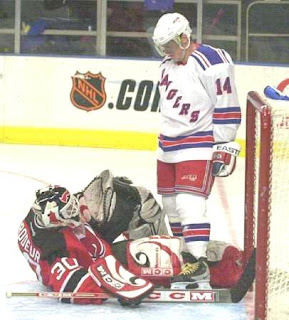 Much like I hate when people choose to throw stones at the Czech Mates - the other fabled line of the Rangers during the similar time long playoff-less periods in New York - I hate when people say that it's silly to look back at something so fondly that didn't end well. Or just because it was the only "bright" spot on an otherwise lackluster team. Quite simply, I think that's unfortunate. Unfortunate to be unable to love and appreciate what was, even if it wasn't perfect. That line and those players gave us something to cheer for - anything to cheer for - in what was a very disappointing series of seasons in the Big Apple. And Theo Fleury was a BIG part of that. After the tears stopped that day - 2/22/02 - they started again when I looked up to see Theo, bathed in the flag of his native country, and I realized just how much that must have meant to him. A man with such talent but whose demons were cutting into the focus he had for the game he loved. As much as I had wanted the Americans to win, I had no regrets that a guy like Theo Fleury (and Eric Lindros for that matter) got to win that day. 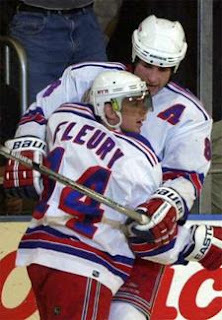 The other thing I loved about Theo Fleury was how well he played against the rival New Jersey Devils. I laugh because even if a player is not in New York long, if they play well against the team's most hated rivals, there is a good chance they'll always be remembered. So when word came round that Theo was going to Flames camp, I smiled. I remembered the guy that I loved rooting for on my team, and I started rooting for him again. I probably never stopped. And when he scored the shootout winning goal in his first pre-season game, I had to smile. When he added a goal and an assist in his next game, I smiled again. The talent was there. The heart and determination was there. It just was a sad reality that at times the demons were there as well. Whether Fleury's return is successful or not, he should be applauded in the attempt. Not many people are able to fight their demons and fight for another chance at their dreams. He's lucky. And I have no doubt in his mind that he knows that. If hope he gets the chance to continue to write his story. And I think if there's any place he belongs, it may just be in Calgary, wearing that familiar sweater he donned so many years ago. Listened to the Coyotes/Lightning game on radio last night =) with some other Prucha fans, and today Beyond the Blueshirts (who does such a FANTASTIC job with coverage on her blog ) posted this post-game interview with the little Pepperpot who scored the Yotes only goal, and even tangled, although not on purpose, with the Tampa goalie Mike Smith. Petr Prucha post game interview 9/22/09 - Enjoy! The Great Trevor Linden on Video Games, Retirement, and the NHLPA. . .
After a day like today, it was such a pleasant surprise to hear that the great Trevor Linden was going tobe on Vancouver's The Team1040. It's always a pleasure to listen to such a great and humble man. Today was no different. He was on to talk about NHL video games, but he ended up talking only very briefly about them. Mostly to say he never played them, really, except when he'd to go Canucks Place and The Ronald McDonald House and the kids would want to play against him, a real NHL player. "They took great pride and pleasure in destroying me," he said of the kids. Asked on how there is comparison to young Canucks Draft pick Cody Hodgson, Linden said that Hodgson has more pressure than he did, mostly because there had been such talk about Hodgson for years, and he, he said, he just kinda showed up. Of Hodgson he said, "I'm impressed with the amount of quality hockey people that have been complimentary of his skills. . .Everything you read about this guy - he is the real deal." On his retirement, and when asked what his plans are for any return to hockey, he replied, "It's gone by very quickly. I've enjoyed having a more flexible schedule...I certainly consider and have had some opporunities to get back into the game. My plan when I left was to take a few years [to think about it]..."
He continued, "I certainly think about where my fit would be in the game. I'm not exactly sure where that would be. There are some questions I don't have answers for right now." After that, with only a brief detour onto former teammate Roberto Luongo - of which he had nothing but praise and said he's a perfect fit for Vancouver - Linden freely and admirably discussed a topic very near to him in the NHLPA. "It's a little bit frustrating from my standpoint. This search committee was supposed to be the answer to everything. I guess they hired the wrong guys. When you look at Ian Penny, he's basically undermined two executive directors at this point." "I am concerned. I think it creates a very unhealthy environment in the [NHLPA] office. It's disappointing but I hope they get it right." "I think the payers do care more. I think they are concerned first and foremost with the task at hand." He then mentioned a concern I think some people have voiced in the last few weeks. How young most of these player representatives are. He said they can "get influenced by people talking more and louder than everyone else." He goes on to say, "I think we had the right guy when we hired Ted" and that he "doesn't feel vindicated" by what has happened. He instead said, "I think it's very unfortunate what happened. Ted is a good man and did a good job for the players. He would have been a perfect fit [for the direction it was going. ]It was very disappointing to see what happened." "I want the players to do the right thing and be successful and to work together with the league and to try to create a better league in the future." As always, a great interview by a humble and great man. 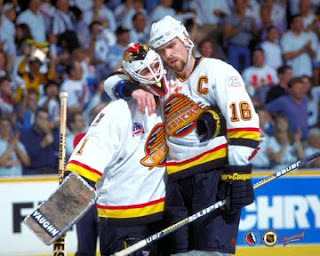 Pratt and Taylor talked after Linden had left the line and they said who but someone like Trevor Linden would take the time to talk so openly and honestly about such a difficult topic. To hear the interview in its entirety, please go to the Team1040 website.